A Blockupy rally at the newly opened luxury headquarters of the European Central Bank in Frankfurt has turned violent with protesters throwing stones and burning cars - and police responding with tear gas and water cannons. Demonstration leader Ulrich Wilke has officially announced the end of the mainly peaceful march at Frankfurt’s Opernplatz (Opera Square). Frankfurt police have reported the lobbing of stones at police officers and red smoke filling the city’s square. According to the police, the number of protesters has risen to 17,000 people. Watch the latest updates in Peter Oliver’s RT report. Blockupy protesters have been supported by Germany's Green party, which also condemned this morning’s violence. "Protest against the policy of austerity in Europe is more than justified," party finance spokesman and MP Gerhard Schick wrote in a statement. "The crisis policies until now have failed... the ECB should take this criticism to heart," he added. According to figures just released by Frankfurt police, there are around 10,000 people at the Römer city hall, waiting for Naomi Klein, a left-wing activist and writer to give a speech. Fourteen police officers were injured, and 80 returned to their duties after being exposed to a homemade gas concocted by protesters. Out of the current 6,000 protesters, over 1,000 were foreign activists, Christoph Kleine, spokesman for the Blockupy event said. According to the organizers of the protest, at least 128 people were injured. 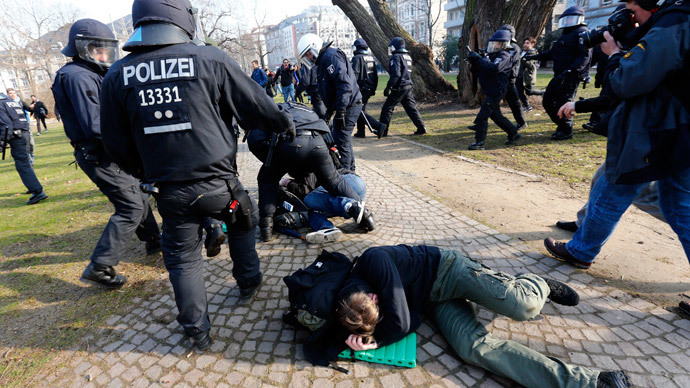 Tear gas and pepper spray caught 107 people, and 21 others were beaten by police batons, the Frankfurter Allgemeine newspaper reported. According to their Twitter blog, Frankfurt firefighters have been called out 47 times since 5:50 am to extinguish burning barricades, vehicles, police patrol cars and rubbish bins. Two firefighters were injured by tear gas, but were helped by medics on the scene. The windows of a fire engine and a command vehicle were smashed.